Welcome, within the heart of Brussels! Manhattan Hotel is centrally situated, close to the central station and also the Grand Palace. There was nothing to like, the only good thing I can think of was its location. Most of the hotel staff can speak English. 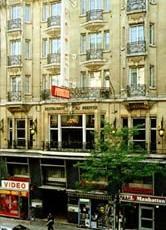 The hotel has a very great location, only 10 to 15 mins walk from the Grand Place. It has a great money value. Also, we booked a quad room with a private bedroom and it was very spacious. Nice staff, outstanding location, average room which completely matched my needs, awesome elevator! The hotel looks like it possibly was inside the sixties, which brings a nice vintage atmosphere. Cool elevator :) The location is best : just by a metro entrance, and 10 minutes from center by foot. Good lacation in city center, nice and professional staff, not very expensive. Very central to everything. Warm and friendly staff. I read lots of negative feedback from others about this hotel, but its not true. First of all, you get what you pay for so don&'t expect the Grand. Second, if you are polite to the employees they will be polite back. Hotel Manhattan was excellent for our trip, and will almost certainly stay there again next year. I liked the down-town location exactly where everything was easy to get to. Location is great for Brussels. Transportation to city town is 10 minutes by walking. * Hotel Manhattan rated 3.33 out of 5 based on 9 customer reviews. Hostel reviews with a star rating are sourced from HostelBookers. If you find Hotel Manhattan with the same booking conditions at a lower rate somewhere else on the internet after you have booked, we will refund you the total difference.